Hospital Risk Management: Good or Bad? G. Eric Nielson & Associates often receives phone calls from injured patients that have been discussing their injury and negligent care with a hospital risk management representative. The hospital representative is polite, seems understanding, and has expressed a level of willingness to work with the patient. Often, they have offered to pay the patient’s deductible or co-pay. Be very weary in this situation. Risk management is NOT your friend. They are hired by the hospital to save it money. Their job is not to make you whole. If they can lull you into accepting minimal compensation for your injury, they will. Risk managers are not bad people. But they approach your injury with eye towards resolving the situation in a manner favorable to the hospital as quickly as possible. They are not concerned with whether their offer compensates you for all of your past medical expenses, future medical care, lost wages, pain and suffering, or any other damage caused by the hospital employee’s negligent conduct. They will make you feel like they are your friend, that they have your best interest at heart, and they will try to convince you that you will not get anything more if you hire an attorney. They are trying to do their job – save the hospital money. To understand this, we can relate it to the same as if a person is injured in a car accident, something a large amount of people have experienced. When a person is the victim of a car accident injury, the insurance adjusters call endlessly to attempt to get a settlement. Typically, these settlements are much lower than what a person deserves. The same goes for Hospital Risk Management teams. While a typical employee of a company is hired to make a company money, these people are hired to save their company money. They are simply doing their job, however their job is not in your best interest. 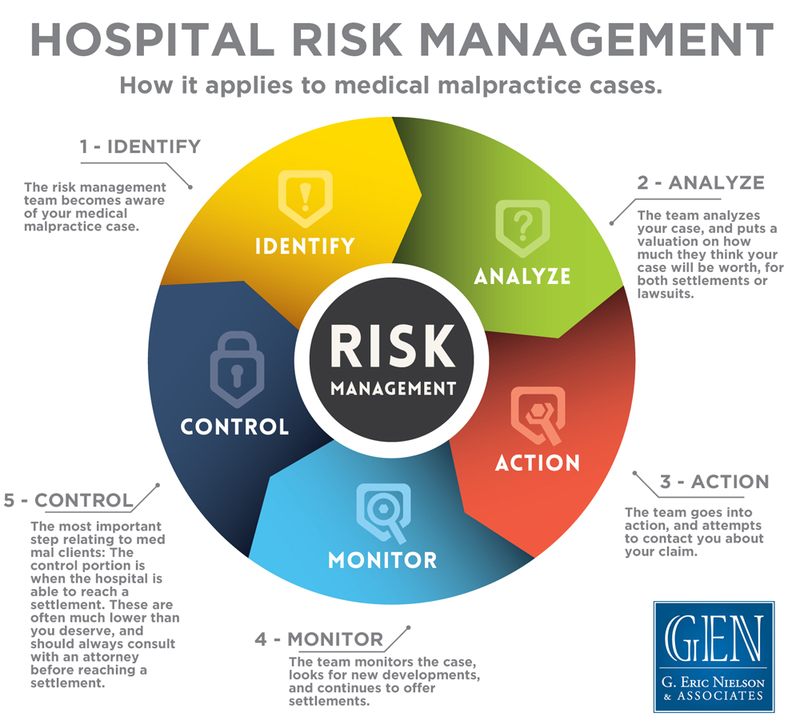 In most cases, risk managers are attorneys that have spent their career defending hospitals. You should have a knowledgeable, experienced attorney representing your interest. Don’t trust the hospital’s attorney to protect your interest. That’s not their job. If you or someone you know has been injured by medical malpractice, contact G. Eric Nielson & Associates. We can represent your interests, and get you the compensation you deserve.